Ansel Faraj is a fresh new talent on the rise, currently working in the independent sector. Still only 21 years old, Faraj has already amassed a considerable body of work, and he maintains a prolific work rate. With an interest in many genres, a strong DIY ethic and his skills constantly being honed, Faraj is a filmmaker to watch. 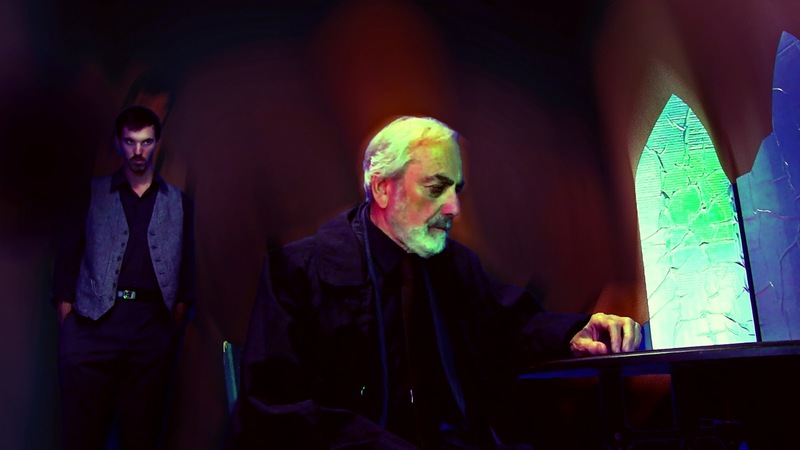 I spoke to him about his latest film (which premieres in L.A. in May 2013), a modern update of DOCTOR MABUSE (2013), and the road it took to get to his biggest-budgeted and most ambitious offering yet. I was born and raised in L.A., in the middle of Hollywood, so I don't think there was ever any escape from me from going into the movies! None of my family are involved in the industry though. I went to some film schools, but mostly film college. When I was six years old I knew I wanted to make movies. I started teaching myself back then. I went to Santa Monica College for a semester and then went to the Art Institute for two years. Aside from constantly watching movies, there were other things I did. I would get the scripts to movies and learn how to write my own scripts by following the scripts along as I watched the movies. I'd get the film industry books and figure out why certain techniques were being used in particular films. I watched a lot of 'making of' documentaries and tried to recreate some of the filmmakers' techniques in my own way. I learned from experimenting and reading a lot of 'How To' books. How did you finance your short films and feature films? My family has always been very supportive of my movie making and have always helped me financially. 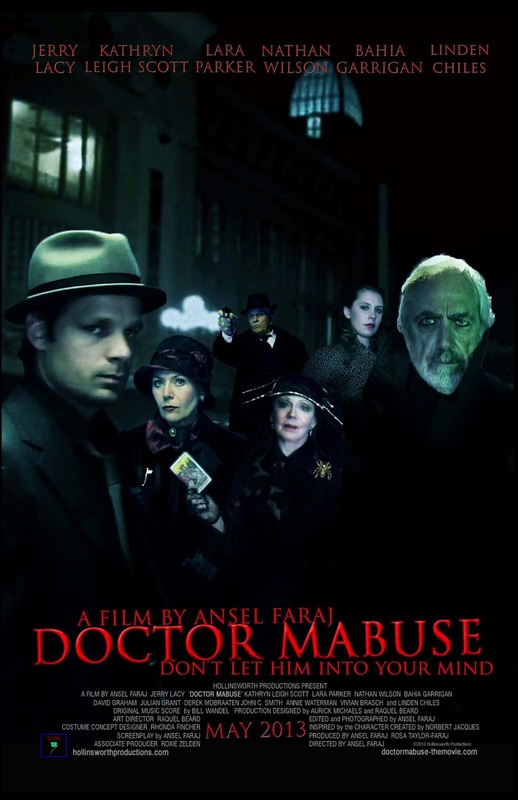 My latest film DOCTOR MABUSE is the first film where I've gotten a high-ish budget and outside financing. It's also my first big film with professional actors. What films and filmmakers influenced you growing up? I used to watch the classic Universal Monsters horror movies, the Hammer Horror movies and the Roger Corman/ AIP thrillers. I also used to enjoy watching John Huston films like THE MALTESE FALCON (1941) and THE TREASURE OF THE SIERRA MADRE (1948). A wide variety really. I would watch whatever classics were available. I was watching these films while my classmates were following the latest 'Pokemon' or something. They would never have any idea what I was talking about! What were some of the first short films you directed? I've done so many that it's difficult to remember, but one of the first things that I did was a stop-motion sequel to THE BRIDE OF FRANKENSTEIN (1935), which I'm really proud of. It continued the story of what happened to The Bride after she escaped. I used little action figures and filmed it on VHS. I would convince my school friends to come back to my house and be in my movies or help out. I also convinced my high school teachers to let me do book reports that were little short movies. I just filmed anything and everything I could think of. I think I was about seven when I did my first little short film. When did you graduate to making longer films? I started making longer feature films when I was about fourteen or fifteen. It was a challenge to see if I could write something that had a longer narrative and be able to pull it off. I did a weird sci-fi movie based on H.P. Lovecraft's stories. It was a really strange non linear experiment. I wanted to try to capture Lovecraft’s atmospheric writing in a cinematic way. It’s called HUNTERS OF THE DARK (2011). I like the movie for what it is, an experiment in atmosphere, but I don’t think a lot of other people like it. They don’t seem to get it I think. They expect it to be scary or violent or have great million dollar CGI special effects, when it doesn’t. It has some very odd imagery, and some nice writing. It’s much more art house, and maybe that’s the problem. But I like it none the less. Then I got very much into 'Batman' comic books and I did a trilogy about a hardboiled detective fighting comic book style villains in a realistic setting. It’s collectively known as ‘the Adam Sera Trilogy’, Adam Sera being the name of the detective. The first one is called OLD FRIENDS (2010), and its about his hunt for a serial killer. It’s okay; it was done with absolutely no money, and just filmed randomly. I wanted to try to do an action movie, and so I filmed random action scenes, then went back in and wrote the script around these action scenes. It probably wasn’t the best way to handle things, but I was just dying to film something. The second film is way better; it was scripted from beginning to end, as a psychological thriller. Its called THE BURNING WITHIN (2012), and I sort of feel it’s the film that really let me come into my own as a young independent filmmaker. I still had no money, but at least this time I had a script. And the acting is better in it too. It’s more thought out from all aspects. 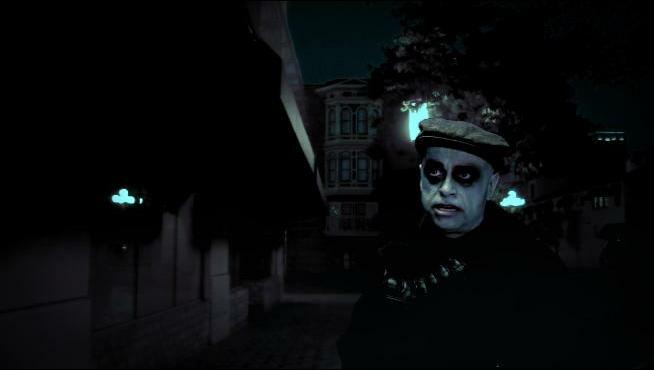 The final film is THE HAUNTED MEN (2013), which wraps up the story and is more film noir. It’s about trying to tie up loose ends before death comes, whether its relationships or unsolved cases. It too is a vast improvement over the first two films. It takes its time, it’s more mature. All of these films are on YouTube to watch. I was experimenting with different styles of filmmaking and with different genres like comedy, fantasy and others. I was finding out what my strengths were as a filmmaker and where my true interests lay. How did you make the transition to using professional actors? I mostly used my friends in my movies and then a family friend met an old character actor named Linden Chiles, who had appeared in Hitchcock's MARNIE (1964). Two years ago she introduced me to him. I was doing this Gothic horror anthology and I asked him if he would play Lord Henry in 'Picture of Dorian Gray'. He hadn't acted in a while so he said 'Why not?" Working with a professional actor for the first time, I knew I had to up my game and work even harder. I started trying to enter my films into as many festivals as I could to try and get my name and my work out there. I was so happy when I won an award for Honorable Mention for Best Comedic Writing at the Buffalo Niagara Film Festival. It was for my film BROTHER DROP DEAD (2012). I started getting more professional people and my technique improved. Why did you decide to make a film featuring DOCTOR MABUSE? I saw the black-and-white 1922 original (DR. MABUSE - THE GAMBLER) a long time ago and I liked the idea of this ultimate super-villain. He has the power of hypnosis, he's a master of disguise and since he's so smarter than everybody else, he's able to constantly evade his pursuers. I thought there would be a way to do this for a modern audience. I've had the story in my head since I was sixteen and I've always thought that if I ever had the money to do it, I'd love to make it as a film. I'm interested in what makes the character the ultimate super-villain and what makes him tick. It was also an opportunity to have fun blending a variety of stylistic influences - German Expressionism, film noir and '60s psychedelia. It's an apocalyptic, psychological, film noir thriller with the influence of Robert Aldrich's KISS ME DEADLY (1955). There's a lot of paranoia in the film, and it constantly shifts mood and tone. Visually, the lighting scheme is influenced by Dario Argento's SUSPIRIA (1977). At times it's very stark contrast film noir and at other times it's like Technicolor surrealism. When did you start filming the movie? 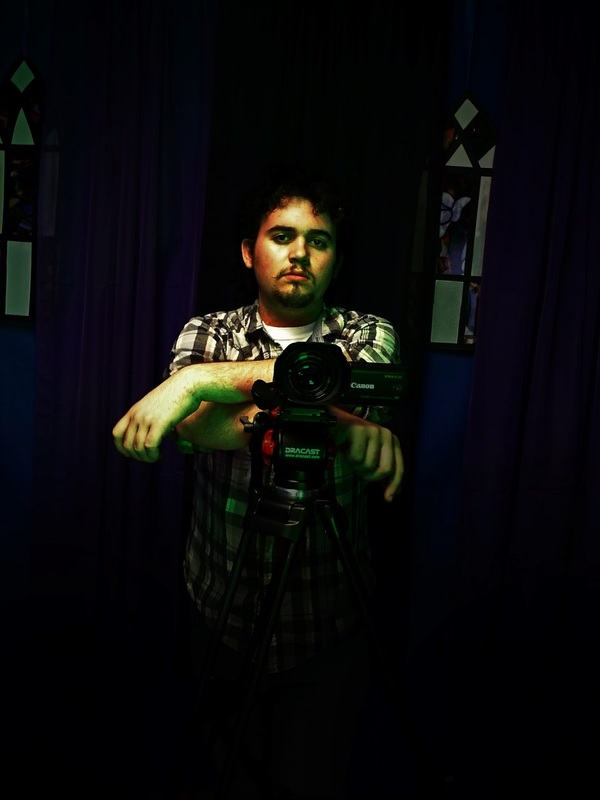 We started pre-production in April 2012 and then filmed from June 5 to July 10. We shot using blue screen to save money and so we could film in a single location and would be able to control our environment. There are only seven crew members on the film. We also had a three week shoot where I went out and shot specific buildings in L.A. that I wanted to use in Mabuse's world. I'd then superimpose the actors onto the footage. How did you manage to cast three actors from the 'Dark Shadows' TV show? I've always loved the TV show. It's such a great, weird show. There was one character that I particularly loved called Reverend Trask. He used to scare me to death. He was played in the show by Jerry Lacy. 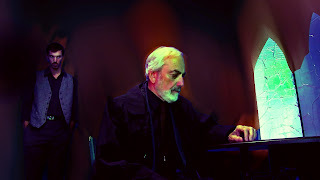 When I was writing the DOCTOR MABUSE script I thought it would be great to get Jerry Lacy to play Doctor Mabuse. I thought there would be no way though that an actor like that would ever read a script written by a seventeen year old. Fast forward to March 2012 and I got the option to make the movie. I thought I would just ask him since all he could say was no. I sent him an email but I didn't hear anything. I thought I'd probably have to cast a non-professional actor in the part. There were two other roles (Madame Von Harbau and Madame Carrozza) I thought would be perfect for Kathryn Leigh Scott and Lara Parker, both of whom had also appeared on 'Dark Shadows'. To my surprise Kathryn said yes, and she had the same idea to bring friend Lara Parker onboard, whom I could not find contact info for. Two days before casting sessions were to begin, Jerry Lacy emailed me as casting sessions were underway and said "I'm sorry if I've caused you undue duress. I just got your email about DOCTOR MABUSE. I would be interested in taking a look at the script if the part is still available." He told me later that because i was such a young filmmaker he was expecting a 10 page script that he could film in a day and not a 100 page script! We talked on the phone and he liked the script. I somehow convinced him to act in the movie, and it was such a joy to work with all three actors. What was it like working with actors you really admired? Having the read-through at my dining table was nerve-wracking and intimidating. It was so surreal growing up watching 'Dark Shadows' and having three of its cast sat at my dining table doing the read-through and speaking lines that I wrote. But once work starts you have to get over being a fan. You're the director, and everyone is there to work. I did deliberately wait until near the end of the shoot to ask Jerry a question about working with Woody Allen on PLAY IT AGAIN, SAM (1972) whilst I was fixing a light! How was the experience of making the film? It was a really interesting shoot because I was working with professional actors. i could really go into the psychology of the characters with them and they could bring all the tricks that actors have. We had a smooth shoot, and there were no rough patches. I know the actors were bewildered by the blue screen because they had nothing to work with. It was a lot of hard work but fun and rewarding. What things did you learn making the film? I honed my skills at making a little money go a long way in terms of how expensive the movie looks. I learned how to develop characters better, how to talk with actors about how they saw their characters and then incorporate their ideas into the script. Dealing with blue screen was a huge learning curve. 70% of the film was filmed using the process. I've now got it down to a formula, and enjoyed the challenge. At what point did you realize you had a strong film in your hands? It wasn't really until I was going through the footage and starting to edit it, noticing some of the strange angles and lighting choices, that I realized we really did have a good movie. When you're working on a movie, whether it's funded by Warner Brothers or your family, once filming starts it's a constant uphill battle to ensure everything is working and you're getting what you need. You don't really have a moment to step back and reflect on how things are going. Is the editing process something you enjoy? Editing is where you make the movie but it is a pain in the neck. It's very stressful and frustrating but it's rewarding when you can see that scenes are working. I like to spend as much time editing as I can get, so I can fine tune the movie to what it needs to be. With DOCTOR MABUSE the ball started rolling quickly so the editing process was sped up. But I didn't let that interfere with getting the film right so that it would be a good, entertaining movie that didn't drag in parts. I've gotten better and better at doing that with each successive film. Do you feel there are themes that recur throughout your work? I never thought about that until recently when I went back and looked at my old films. I guess duality is a theme that keeps cropping up in my work. Which filmmakers do you admire the most? Christopher Nolan is brilliant. Peter Jackson is a big hero of mine. I relate to him because we both kind of started off in the same way. I also like Paul Thomas Anderson and David Fincher. From the past I like Ken Russell, Fellini, Robert Altman, Orson Welles and Kubrick. There are so many others. 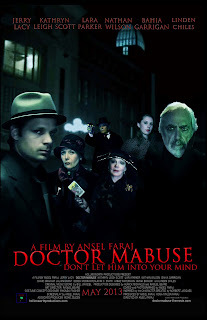 Well, in June I start filming DOCTOR MABUSE II, which is going to be a lot of fun. Everything goes to hell for all of the characters, and that’s always a lot of fun to play with. I talked another 'Dark Shadows' actor to come on board, the awesome Christopher Pennock, and he’s playing one of the new villains - that’s all I shall say on the subject. And then in December, I have a very bizarre road movie-fantasy-superhero-mashup film coming out called THE RISING LIGHT, which also stars Nathan Wilson, Kathryn Leigh Scott, and Linden Chiles – all from DOCTOR MABUSE. I’m also going to be directing a really cool cyberpunk mystery/comedy next year that I wrote, which I’m really looking forward to. So I guess you could say I’m quite busy at the moment, but I would not have it any other way. I spoke to Ansel by telephone on 27th November 2012. I would like to thank him for his time. All photographs are copyrighted by Hollinsworth Productions. Various Ansel Faraj films can be viewed here. The website for Ansel's production company, Hollinsworth Productions.